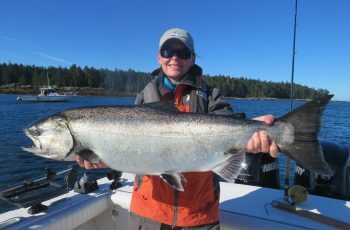 Perfect weather, fish on the bite and many happy guests, what more could the guides and staff ask for! 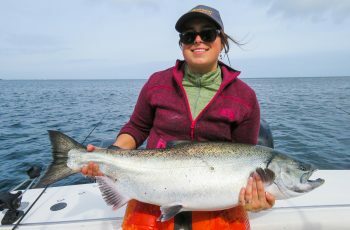 We have just concluded our trip here at Langara with a total 10 tyees angled, largest the 41 lb fish caught the first day. 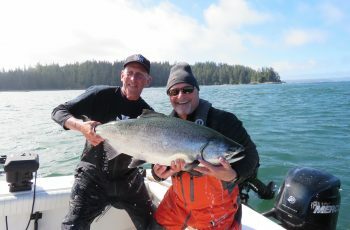 Top fish today was a 36 lb tyee for Al Wortzman, well done! Ryan Alden grabbed a 30.5 in boat 17, good work Conman, keep em coming. Matts 26th birthday today, spent out at Cohoe Point! That is right where Conman would want to be, dragging cable and hammering chinook salmon, no better way to spend a day. I finished my trip with John Simpson and Jollean Hancen on Tuesday, and we had a nice fish to end the trip with. 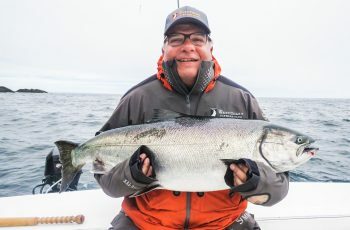 After dragging deep for the morning out at Cohoe, we blasted out to the monster pit and first rod in, John sank the hooks into a 31 lb tyee, and promptly played the fish for 30 minutes, a battle for sure. We had a look at the fish in our hippaquarium and took the measurement, pics and of course released her. 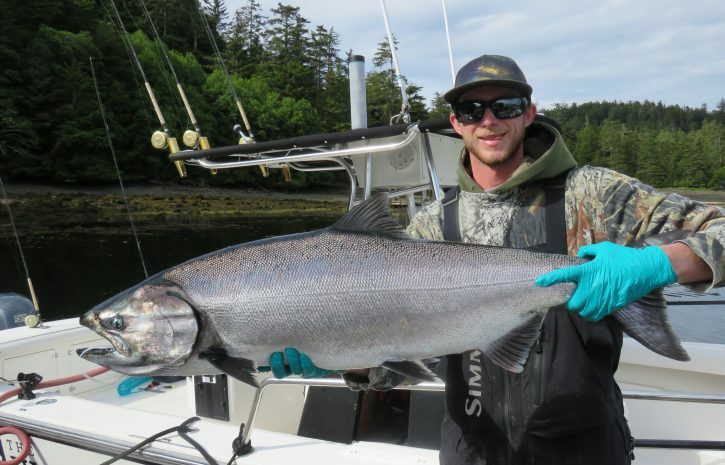 We had open spots on the card, but no way are we wacking a tyee, especially after that fight. Sunny, warm, calm…beautiful fish, not about to end the perfect trip with a thud, and we all felt pretty good about seeing her swim off, away from the bowl! Now that was the perfect trip, thanks John and Jollean. Today saw me fishing with a tougher client, old man McIntyre, Rod, manager of North Island Lodge. A very happy Rod, looked ecstatic to climb off his barge and into my 30 foot whaler, and do what he always loved to do, out fish me on his side of the boat, while berating me and my techniques and lack there of. Gee this guy can dish er out, ahh Rod! Telling me to go here and there, dammit Rod, you have never been to the bowl before.60 feet? Gee Rod, how about 30? Rod insisted on 48 feet off a rigger…who fishes 48? Hmmm, and wouldn’t you know it, his mooching rod at 12 pulls with a Whitey roll Screams and Screams, a no brainer hit. Wow, Rod was nervous, told me the fish had a big paddle, heavy, what do you do about headshakes? More questions than a rookie guide, you can do this Rod, I am thinking, you guided for 17 years and were bloody good at it. 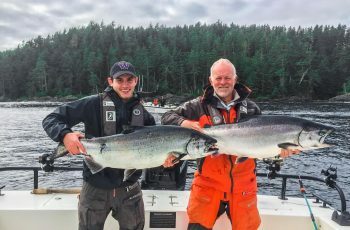 We spun the platform as rod refers to it and got on our fish, the Rod corked out and underwater, not the monster but a nice staff fish, 25 lbs…enough to feed Rod for two years. Rod grabbed a jack as well at 18 lbs, so that will keep happy to next time. I did grab a humpy, but to tell you the truth, I was busy guiding, tying knots, getting Rod out of the kicker, replacing leaders, tough customer I tell you. Oh did I mention his bantering, felt like I had Burrows chirping at me in one ear, Kesler in the other. And yes, I did have a fun afternoon, and remember why the Clubhouse misses Rod so much, a classic guide, one day in the hall of fame here at Langara, probably one position lower than the Screamer. All in all a great trip, and the weather looks fantastic for the next week! We have good fishing, lots of wildlife in the area as well. Had the rare oportunity to load my boat with Clubhouse girls last night and get to some transient whales off Pillar bay. We shut down our boat, stealth mode, in the kelp, and the whales, mothers and calves approached us and had a good look, pictures were amazing. These whales were super curious and gave us a show on a hot sunny night, glass calm, and Ainsley, Alex and Noel Bellis,s daughter for one brief moment, did not HATE ME ha ha. Coulda sworn his name is Tod, not Rod ………..